Heineken have recently extended their sponsorship as the official beer sponsor of the UEFA Champions League until 2015, marketing under the slogan “Heineken and the UEFA Champions League: Great Together”. This is not a view that appears to be shared by UEFA, because tournament regulations prohibit the purchase of any beer at Champions League matches in all bar executive facilities. The reason for the prohibition on the sale of alcohol in spectator areas of the stadium is because of the belief that alcohol is related to instances of football crowd disorder or ‘hooliganism’. It is accepted that alcohol consumption acts as a dis-inhibitor when it comes to the behavior of human beings, which is of course one of the reasons it is so popular, and one might assume that it follows from this that alcohol increases the risk of an individual becoming involved in violence or disorder. In fact, despite numerous scientific studies investigating the link between alcohol and violence, a direct pharmacological causational connection has yet to be established. It is clear that alcohol makes some people more likely to become involved in this type of behavior, but even here, it appears only to have this effect sometimes. Furthermore, alcohol consumption does not appear to have this impact on other individuals. The ‘common knowledge’ that alcohol leads to hooliganism also does not stand up to scrutiny. Instances of serious organized violence usually take place with no or little alcohol consumption (after all, being drunk inhibits one’s abilities to fight) and while alcohol has been seen as one factor in lower level crowd disorder, it does not seem to be a primary motivational factor. Football crowds with a reputation for heavy drinking (for example the Scots, the Irish and the Danes) do not typically have a reputation for violence or disorder. Similarly, why is it that cricket or rugby do not have the same reputation for ‘hooliganism’, when social alcohol consumption is an equally (if not more so) important part of match-going culture? 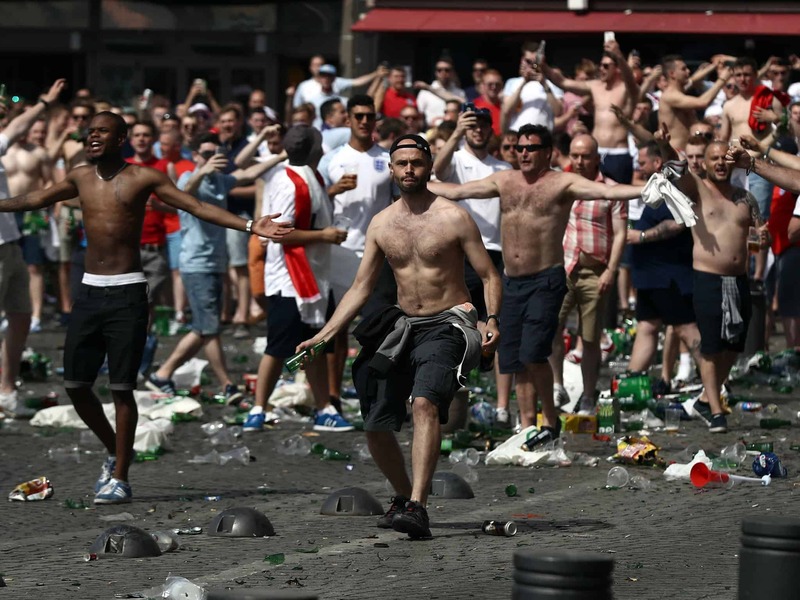 Finally, an analysis of serious disorder engaged in by English fans also questions the role of alcohol – typically where alcohol is more readily available we tend to see fewer instances of crowd disorder than where access to alcohol is restricted. However, even if we assume that consumption of alcohol (or at least the social consumption of alcohol) is related to disorder, do restrictions on the availability of alcohol assist in football crowd management? My research and that carried out by other academics into football crowd behavior and the policing of crowds suggests this is not the case. My own research carried out in the course of writing An Ethnography of English Football Fan: Cans, Cops and Carnivals indicated that alcohol restrictions such as bans on drinking on official transport to matches, prohibitions on the sale of alcohol in stadia, and the closing of bars around the stadium did not have a significant impact upon levels of alcohol consumption. Where fans were part of a match-going culture based upon social drinking, the restrictions would typically not reduce the amount of alcohol consumed. Bans on alcohol consumption on transport often meant that fans simply took different modes of transport to matches allowing them to drink, or would set off earlier in order to drink before the match. Bans on the sale of alcohol in stadia usually had the effect of fans engaging in ‘binge drinking’ beforehand in order to achieve a level of intoxication prior to entering the stadium. City-wide alcohol prohibitions (popular for the visits of English teams to Italy) simply did not work, with most bars still serving and fans always able to find alcohol from somewhere. In many observed cases, these restrictions even increased drunkenness, as fans binge drank and consumed spirits (which are easier to conceal and smuggle where prohibitions are in place) rather than drinking beer at a more leisurely pace. Moreover, many alcohol restrictions not only had no observable impact upon levels of drunkenness, but they also often created situations where confrontation and disorder was more likely. Where prohibitions were in place, fans would typically avoid the local police force; however research shows us that positive interaction between fans and police is one of the best ways to reduce the risk of disorder. Where transport was ‘dry’, fans would travel by other modes, often arriving earlier, or at times and locations unexpected by local police forces. Likewise, bans on drinking in stadia meant that fans were more likely to drink in un-segregated pubs again away from the police and then arrive later at stadia, often resulting in crushes at entrances, concourses and gangways. It is time that we challenged the dominant attitudes of governments and the football authorities when it comes to access to alcohol for football fans. Alcohol forms an important part of match-going culture for many fans, and will remain so for the foreseeable future, however many restrictions are put in place. As such, the authorities need to consider ways in which they can use access to alcohol to reduce the factors that are proved to cause disorder in and around football stadia. Beer and football are “Great Together”, not only for football supporters but for those managing them.